Have the health problems associated with obesity been overblown? In a word, “Yes,” according to Steven Blair, the pioneering exercise researcher and inaugural winner of the $50,000 Bloomberg Manulife Prize for the Promotion of Active Health. Have the health problems associated with obesity been overblown? In a word, “Yes,” according to Steven Blair, the pioneering exercise researcher and inaugural winner of the $50,000 Bloomberg Manulife Prize for the Promotion of Active Health. And all the hype about rising obesity rates has obscured a bigger health problem: “the physical-inactivity epidemic,” the University of South Carolina professor told members of the McGill community at a forum on Jan. 12. Blair’s message on “fitness and fatness” may have raised eyebrows among the listeners who packed the University Centre ballroom for his presentation, but he has mounds of evidence to back it up. During the course of a prolific research career, much of it at the Cooper Institute in Texas, his landmark studies have demonstrated that even moderate levels of physical activity are more important than body weight in determining longevity. Among his major projects: a 40-year study of more than 80,000 people to examine the importance of cardio-respiratory fitness. Blair and his research team showed that as little as 30 minutes of physical activity a day (three 10-minute walks, for example) is enough to drive down mortality rates by 50 per cent – a finding that has helped shape current public-health recommendations for physical activity across North America. “We could not have had a more fitting inaugural Prize winner,” said Dean of Education Hélène Perrault in introducing Blair at the McGill event. 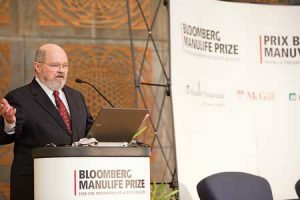 The Prize, founded in 2011 by Toronto-based investment manager Lawrence S. Bloomberg and corporate sponsor Manulife Financial, is administered by McGill and awarded to a researcher whose work promises to help improve the health and well-being of North Americans. Blair received the award on Jan. 11 at a ceremony in Toronto’s MaRS Centre. While many people contend that an increase in caloric intake is behind the rise in obesity rates, Blair argues the data for that argument are unconvincing. Important changes in methodology in a long-running U.S. national survey of eating habits, for example, need to be taken into account – and often haven’t been, even by serious scientists. The obesity problem has been hyped “and the science is not very good, because too many (studies) haven’t taken physical activity into account,” he said. What’s more, doctors typically don’t even mention exercise when meeting with patients. Blair and others on his research team argue that a major cause of obesity is the shift toward more sedentary jobs, and away from physical work such as farming, mining and manufacturing labour. “We need a broad-based program” that deals with the “physical-inactivity epidemic” as well. Blair’s advice: “Let’s stop talking about weight and obesity. Let’s focus on healthful eating. I’m not a dietician, but I know enough: Eat your fruit and vegetables – grandma taught me that – and focus on whole grain, rather than highly processed grain.” Don’t eat too much fat, especially trans fat, and consume alcohol in moderation. And, of course, get in 30 minutes of exercise a day, five days a week, for the 150 minutes a week now recommended by the U.S., Canada and the World Health Organization. “Just 30 minutes a day, five days a week, can save your life, (and) certainly make a big difference for your health,” he says – whether you’re thin or fat.